Forklifts have come a long way from your grandpa’s time when they featured only the bare essentials, but they have left a legacy. The future of forklifts is here, and it means increased production on a whole new scale for warehouses and businesses. Need a solution to increase your production or reduce cost? New developments affect the lift truck market every day, and it’s only a matter of time before you’ll see these features and tools in your own warehouse. Driverless Forklifts? This is only one way that technology could really affect business.Technology can not replace certain skills that humans can do, but computers don’t get tired and they don’t have to face some of the challenges that humans do such as having poor judgment or making errors. Here are five lift truck innovations worth knowing about. Today’s business environment is fast paced and forklifts are a critical element which helps industries keep up with the pace. Information is key and the status and location of your equipment is more important than anything else. All companies have challenges with labour costs, optimal performance and the behavior of those operators is an ongoing effort. Did you ever wonder, where is my forklift? Is my forklift being Utilized? How Healthy is my Forklift? Well, now you don’t have to wonder. Fleet remote monitoring technology is like a GPS that puts you in control of your equipment – anytime, anywhere. Fleet remote monitoring technology is a satellite monitoring system that can track and send your equipment information directly to your computer, smartphone or tablet and maximize output through increased efficiencies and timely maintenance. This systems allows you to view information directly on your computer by a satellite download and will keep you fully informed about the type of work your machine is doing, exactly where your machine is, if your machine is safe, and whether your machine requires service or maintenance. The on-board machine health monitoring informs you of any abnormal readings that can be addressed before any major issues happen that could prevent an unnecessary accident or serious injury to the worker. The remote monitoring and its on-going evaluation will also provide you with information about poor or incorrect operator practices such as excessive speed, allowing you to give the operator additional training if necessary. Also the continuous monitoring of the machine’s condition helps you achieve maximum production and utilization by reducing unscheduled downtime. This easy access web application will help protect your investments and give your forklift a longer life. Imagine having a bunch of tiny drones zipping around in your warehouse that can automatically track and monitor inventory. Drones developed by MIT researchers buzz around the warehouse finding a particular item faster than your employees can. This will leave the workers free to manage and move material. Small drones can fly around your warehouse safely and can read dirt-cheap, battery-free inventory tags which receive power wireless from scanners. The tags can be read from “tens of meters away with a 19cm margin of error. The identified inventory number enables workers to log inventory more efficiently than they could by reading and recording it manually. A loss of $3 billion in revenue was report by Walmart because of mismatched inventory. The U.S. Army also lost track of $5.8 billion of supplies among its warehouses, because of mismatches between its inventory record and stock. It takes 3 months to perform a complete inventory at a single large retail store like Walmart. Mismatches can go undiscovered until customers do an actual count. This drone system could save retailers billions of dollars lost through faulty inventory records. The drone has a challenge of only being able to read a range of no more than a few centimetres, but it can fly within close range of humans safely. Because of its lightweight plastic rotor, it won’t cause injury in the event of a collision. We anticipate that drones will be used in a lot more applications than just tracking inventory. In the warehouses we could see drones making deliveries as well as watching the equipment in the yard. There are many possibilities from monitoring crops and animals, in depth projects like pipelines, construction related facilities, and medical fields where the drones could be used to reduce safety risks and protect workers better. For now, drones are improving a number of other areas in warehousing, and their technologies will continue to be explored in the future. The jobs involved aren’t going away, but they are going to change. Solar panels are a game changer revolutionizing the way people use energy. The sun dishes out every day free solar energy; yes free! Imagine running your plant or powering your forklift equipment with solar panels on your roof with free sun power. The solar industry is one of the fastest growing and due to the growing popularity of solar power the prices are coming down. Switching from lead acid batteries that struggle in hot and cold temperatures to solar panels that stand the heat is a great option. Solar battery performance will only go down ten percent when it is 0 degrees Fahrenheit and at 86 degrees Fahrenheit, solar batteries will continue to work, but performance goes down by 20%. Solar batteries do have to work extra hard when things warm up, but they can still stand the heat. Solar panels will have a tremendous impact on forklift owners’ cost savings.Traditionally, owners buy diesel forklifts because they are cheaper and cleaner to run. The new generation of solar has surpassed the diesel in the cheaper and cleaner to run department. The performance comparison is pretty much the same and the running cost has been slashed substantially. 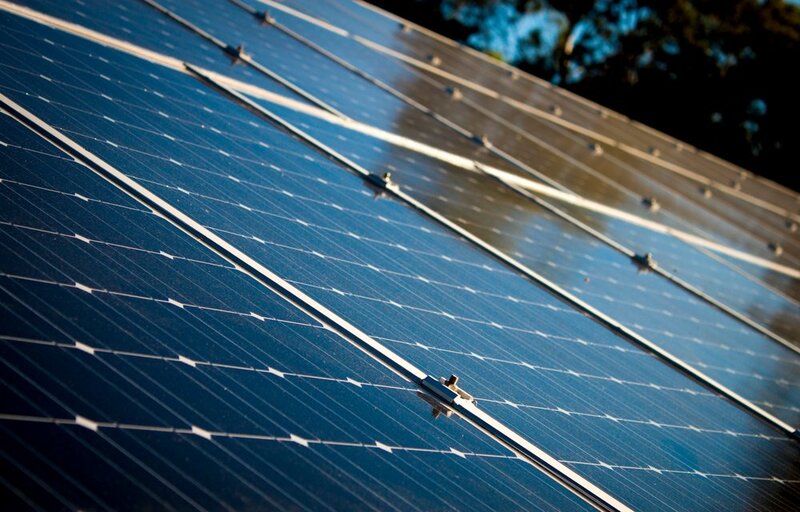 Solar panels collect energy from the sun and turn it into electricity. Solar batteries work by converting the AC energy produced by the solar panel and storing it as DC power for later use. If your battery is fully charged it will send electricity back to the grid, so for those cloudy days you can draw the energy you stored earlier. Some solar batteries have their own inverter and offer integrated energy conversion. The higher the battery’s capacity, the larger the solar system it can charge. Business owners have enjoyed the savings solar power gives them on their electricity bill and have benefited from rebates returns. It’s also environmentally friendly and they even sell some electricity back! Solar makes good economic sense. Companies are not only saving, but participating in the battle against global warming and reducing the country’s dependence on foreign resources. Are your employees listening to music, talking on cell phones, or staring at the ground? Too many accidents and fatalities are a result from being struck by forklifts. New safety add-on features for forklifts will help make your workplace safer for both operator and pedestrian. More and more safety innovative forklift features are being made such as motion sensors for forklifts and warehouses, visible lights that shine to the ground for pedestrian awareness, sensor mirrors and alarms. Making it simple to paying attention to your surroundings will improve forklift safety. What is your number one priority? Your employees of course! The motion sensors blink when activity is detected to warn the operator and all pedestrian traffic to pay attention to their surroundings. This will help reduce pedestrian and forklift accidents, because each and every year there are way too many fatalities. Pedestrians tend to “be in the zone” and block out a repeated warning sound as it becomes irritating, but the Blue forklift warning light will draw their attention. It projects an intense blue or red light on the floor in front or behind the approaching forklift’s path, warning pedestrians of its approach and direction. Employers can also put up motion warning lights at crossings, blind corners, doors, and exits to ensure the safety of all employees. The newest product is a tag worn by the pedestrian which once they enter the detection zone around the forklift, the operator is instantly warned of the pedestrian’s presence by an alarm sound. The diver can then take appropriate safety precautions. The alarm will stop when the tag is no longer detected. The following video illustrates the Pedestrian Alert System (PAS). That solution minimizes the risks of accidents between forklift trucks and pedestrians in common work areas. Pedestrians must wear electronic tags that are detected by a device on the forklift truck, warning the driver of the risk. Danger lurks in many forms and with all these new warning systems it should keep employees safe, no matter their shift or location. Don’t wait until there is an injury or death at your workplace before developing a safe system of work to control risks. Driverless Vehicles? Not cars, though, but forklifts, stackers and pallet trucks that don’t require human intervention to move. The robotics service market is growing fast. What are automated guided vehicles? The vehicles follow markers or wires in the floor, or use vision, magnets or lasers for navigation. Automated guided vehicles move product and act independently around warehouses and factories at all stages of production; and all without any human sweat. These self guided vehicles carry loads to and from the production line, the warehouse and into and out of trailers moving product smoothly and safely to the right destination. This video illustrates the state-of-the-art automated guided vehicle systems carrying loads to and from the warehouse, the production line, and into and out of trailers. You will see a whole new world open up in the warehouse industry by how they work, how they are being used, and what to expect in the future. Feeling the labour crunch? This self guided vehicle and its automatic picking task will save time, reduce labour costs, product damage, improve safety, improve flexibility and increase productivity. People fear robots and automated vehicles are taking over jobs in warehouses. Even though they may be very efficient, they are also kind of dumb. They just act and don’t think. Automated Guided Vehicles are basically a helping hand for doing tasks that would be difficult, unsafe, boring or repetitive for a human to perform. People still need to control the robot, do jobs the machine can’t and fix them when they get stuck. Even though machines are getting smarter they will never be as smart as us! of forklift technology, as it’s coming fast and furious! These innovations to some companies mean creating a safer and more efficient work environment or to others going green or finding ways to save money. Adopting new technology allows your company to take control of your warehouse work force and build towards more sophisticated processes and systems.